I think the principal governing historical fact about Europe is that it committed suicide during WW1 ahd WW2. Up until that point Europe had been the economic and military and political centre of the world for 400 years. It was the place from which Portuguese mariners first explored the world, and from which Spanish conquistadors conquered much of it. It was the headquarters of the British Empire and the French Empire and the Dutch Empire and the Belgian Empire. Between them, these empires had carved up much of the rest of the world. And then, starting in August 1914, it proceeded to completely and comprehensively demolish itself. And it has never recovered since. The mantle of world leadership was passed on to others, and never returned. The centres of cultural and economic and military and political power moved elsewhere. The modern political edifice of the European Union is a sort of shanty town that has sprung up among the ruins of the old Europe after its catastrophic self-destruction, like in Rome after its fall, when they could no longer afford to maintain its marble palaces. Post-war Europe is like a little flotilla of the Titanic’s lifeboats, bobbing together on the ocean, waiting for rescue after the great ship had sunk. With that, Merkel explicitly made a bid to give Germany more international prominence, and set her country—in the absence of US international leadership—as the leader of the so-called “free world” ahead of its United Nations Security Council chair, starting Jan. 1, 2019. For there’s a deep hankering in Europe after the power and prestige that had been lost. Europeans had all become nobodies, who wanted to be somebodies again. And so, having lost all their empires, the European states came up with the idea of forming a complete new empire within the boundaries of Europe, rather than one that was scattered all over the world. If they could no longer have colonies abroad, they could at least have colonies at home. And so the European Union is the colonisation of Europe. What else were the old colonialists to do? They had to colonise somebody, so they colonised their own people. After all, when in 1945 the self-destruction of Europe was complete, and many of its old colonialists had come back from their foreign colonies, Europe remained dominated by imperialists and colonists whose only experience had ever been of colonial life in one empire or other. So when they started thinking how Europe might be rebuilt, it was only natural to come up with the idea of a new empire made up of a new set of colonies. Only this time the colonies would be inhabited by European natives rather than African or Indian or American natives. Britain’s current attempt to leave the EU is the attempt by one of Europe’s colonies to escape from this new European empire, in exactly the same way as American colonists attempted to escape from the British Empire. Britain is going to be severely punished by the masters of the European Empire, just like the Americans were punished. Economic logic may demand that trade between Europe and Britain should remain as unfettered as it was before Brexit, but political logic demands that Britain must be punished. For all the other colonies in Europe must be shown what happens when when any of them try to escape: Britain must be made an example of. On this day in 1774, the First Continental Congress sends a respectful petition to King George III to inform his majesty that if it had not been for the acts of oppression forced upon the colonies by the British Parliament, the American people would be standing behind British rule. What Britain faces over the next few years, if the desperate Remainers in Parliament can’t prevent Brexit from happening, will be something like what Britain faced after Dunkirk in 1940: complete isolation from Europe, and the danger of imminent invasion by it. It will be next to impossible to get hold of any Camembert cheese, or Italian pasta, or German sausage, or Spanish tomatoes. We will have to Dig For Victory, and eat potatoes. And as then, Britain will have to rely on the USA and its former colonies for trade and supplies. And in this respect Britain will probably have the complete and unquestioning support of the current anglophile US President, Donald Trump, who is probably the world’s greatest believer in Brexit. It wouldn’t have got that sort of support from any other recent US president, and certainly not Hillary Clinton. And it’s far from certain that Donald Trump will remain president after 2020. So we may only get strong support from the USA for a couple more years. And after that? But the native revolt in Europe looks set to fill the EU Parliament in May this year with nationalists and populists from everywhere in Europe – where they will find that they are as equally dismissed and ignored as Theresa May is presently ignored and dismissed. For despite its democratically elected “parliament” the EU is an unelected oligarchy filled with political appointees. And if necessary they’ll build a wall around their Brussels’ palaces to keep the natives at bay. These people don’t do negotiation, as they have made clear for the 2½ years since the Brexit referendum. And they have no intention of negotiating with the Salvinis and Le Pens and Orbans within Europe either. For, pace Merkel, they now see themselves as “leaders of the Free World”, even though they have imposed the most illiberal smoking bans on almost every country in Europe. So perhaps they really see themselves as leaders of the smoke-free world. For theirs is an inverted idea of freedom. Sir Richard Dearlove, former head of MI6, thinks probably not, I do wonder if he knows something we don’t! Dearlove hoping that MI6 et al can keep the lid on UK involvement in Russiagate. Who knows. Security is opaque. But if the following is to believed he thinks May’s deal with the EU is a threat to five eyes and generally pretty appalling (which is what I believe too). That’s pretty shocking. But I’ve yet to find a copy of the Dearlove letter. The link provided beneath the video is to a series of responses to the letter by Number 10, and rebuttals by Dearlove (I didn’t know Dearlove had his own blog). Has anyone got the complete original letter? 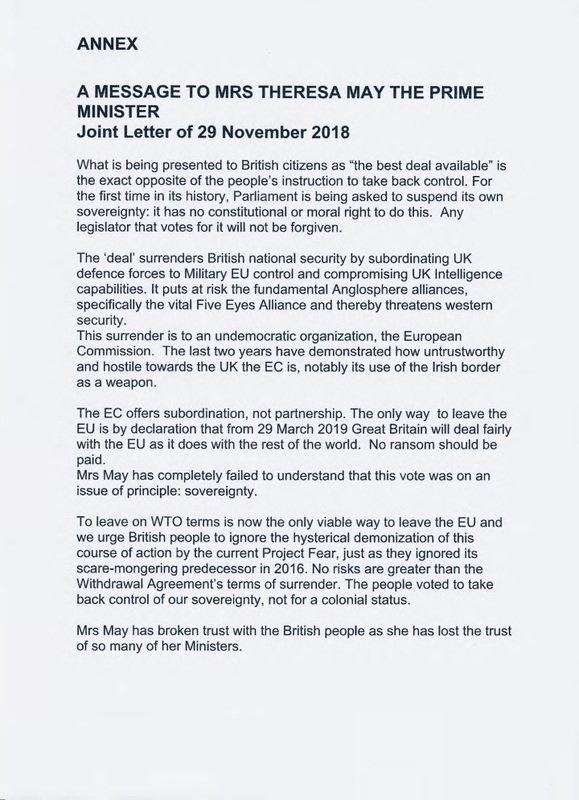 But the gist of the letter might as well have been that Theresa May’s ‘deal’ would sell out British military and intelligence to the EU. But I suppose that since Parliament rejected the ‘deal’ it’s now a dead letter. I’ve got an image of it here. I recall, something like 3 years ago, that Mr. Trump would not win the presidential election. I fully expect to hear that sort of thing about his re-election. Wishful thinking then, sheer desperation now. An article that – for once – tells it like it is. And closer to the election I’d expect him to do a lot more to persuade voters to go for him. I have always thought that the EU is more akin to the great continental empires – the Holy Roman Empire, Austria-Hungary, Napoleon, Germany’s on-off expansion to the east, the Warsaw Pact – and I see a pattern to their collapse which is very relevant to the current state of the EU. The need to avoid regional conflicts required the contracting out of policy to supranational administrators, technocrats and military planners in a way which suppressed divisions of other kinds. Examples: the Holy Roman Empire could not contain the religious conflicts of the Reformation period; Austria-Hungary could not accommodate the rising middle classes; and the toothless democracy of Wilhelmine Germany, with its nominally social democratic legislature, was a front for the continued rule of a landed aristocracy. Political conflict was suppressed rather than channelled by a system of government enjoying ever less popular consent, and ultimately the dams burst and the empires collapsed. I remember reading an article in the 90’s written by an economist who predicted the Greek crisis and more. What struck me was that he predicted it as inevitable and in a matter of fact way. There was no ‘ifs’ or ‘maybes’ it was more a case of ‘this is what is going to happen’. He basically said that what the EU needed, if it were to survive, was a massive transfer of wealth from north to south. But he predicted that as a result of the introduction of the euro that a massive transfer of wealth from the south to the north would occur, causing imposed austerity, youth unemployment and the rise of extremist politics – which is of course is precisely what happened. And ever since then I have thought that the UK should a) retain it’s own currency and b) leave the EU at the first opportunity. It looks like Mays deal is aimed at preventing b) even if she doesn’t realise it. What I find frustrating with the young, is that all they can think about is that they are hard done by with brexit because they would like the chance to work in the EU but if you ask them about what they think about how the EU treated Greece they haven’t got a clue. Well, you can count on me to buy an English wool sweater, some Wedgewood china, and Stilton cheese. Sorry I can’t buy an Astin-Martin, parking is to expensive in New York. Attn Bones: there is no Russiagate. It’s the greatest hoax since secondhand smoke though, like its forebear, its advocates will continue to produce a lot of spurious circumstantial evidence while screaming Eureka! with every find. As for reelection, depends not only on interim events but a lot on which lunatic the Democrats offer and how crazy the country itself has become. For me, Trump will always be the lesser of two evils; not better than that, just better than the other. I’m looking forward to buying things from America that we don’t have now. I’m hoping someone will make a list of things I should look out for. More reasons I voted leave. “EUROPEAN Union trade barriers are the “best mechanism” to export poverty to the third world as high duties on imported products from Africa help EU member states like Germany reap economic benefits while local producers suffer, Labour MP Graham Stringer claimed. “If you take the recently increased tariffs on citrus fruits what it means is that poor farmers in Africa who are growing oranges and lemons, limes and other citrus fruits can’t export to the European Union. Therefore they lose trade, it means people in the European Union have to pay more for their oranges, limes, etc. EU rules banning bent bananas and curved cucumbers are set to be scrapped. “A majority of EU member states, including Britain and Ireland, have voted to reform rules like EC Commission Regulation No 2257/94, which caused international ridicule by stating that all bananas must be “free of abnormal curvature” and at least 14 cm in length. Imperfectly-shaped fruit and vegetables may now be back on supermarket shelves by 2009. ” Under the present regulations, Class 1 cucumbers must be “practically straight” and be bent by a gradient of no more than 1/10. “THE EU is spending £236million of taxpayers’ money building up a “butter mountain” to join their stores of unwanted sugar, grain and wine. The European Commission yesterday pledged to buy up 30,000 tons of butter from farmers across the 27-country union this year as well as 109,000 tons of skimmed milk powder. The unwanted dairy produce will be stored in silos across the continent and will join 317,853 tons of unwanted sugar, 16,000 tons of unwanted maize and wheat and millions of gallons of unwanted wine which Brussels officials has already bought up. EU Agriculture Commissioner Mariann Frischer Boel claims buying up the butter mountain is essential to prevent European farmers going bust. Last night, the policy was condemned an example of Brussels’ waste. “Catch quotas that allow fishermen to land a limited amount of fish have been a key part of the Common Fisheries Policy for a quarter of a century. Now Joe Borg, the EU Fisheries Commissioner, has called for an end to “discards”. And that’s just a few I remember. The U.S. will always be strong allies with the UK. Militarily economically and culturally. We still have over 35,000 troops in Germany.